After a decade of cancellations, false starts, and one tragic studio demise, this is the year we’ll finally see a third Star Wars Battlefront game. Here’s our first look. It’s all CGI—to be specific, it’s “footage representative of PlayStation 4,” according to the trailer—because who needs to see actual gameplay? This new incarnation of the classic Star Wars series will be multiplayer-heavy—there’s no campaign—and it’ll support up to 40 players at once. It’s set during the original trilogy and will feature Rebel vs. Empire battles on Hoth, Tattooine, and other planets including Jakku, a new desert world that’ll be introduced in Episode VII: The Force Awakens later this year. The Jakku level will be free downloadable content, which is awesome. 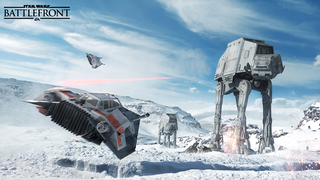 People who pre-order Battlefront will get it on December 1, while everyone else can play it starting December 8. The seventh Star Wars film will be in theaters on December 18.